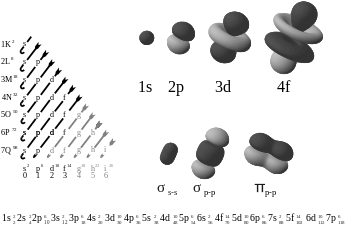 Electron atomic and molecular orbitals, showing a pi bond at the bottom right of the picture. In chemistry, pi bonds (π bonds) are covalent chemical bonds where the orbital path of one electron crosses (overlaps) with the path of another. The electrons have a lobe shaped figure of eight path (see picture). There are two areas of overlap as the paths overlap on both lobes. Only one of the orbital's nodal planes passes through both of the involved nuclei. Two p-orbitals forming a π-bond. The Greek letter π in their name refers to p orbitals. The orbital symmetry of the pi bond looks the same as the p orbital when seen down the bond axis. P orbitals usually have this sort of bonding. D orbitals are also assumed to use pi bonding but this is not necessarily what happens in reality. The idea of bonding d orbitals fits in with the theory of hypervalence. Pi bonds are usually weaker than sigma bonds. Quantum mechanics says this is because the orbital paths are parallel so there is much less overlap between the p-orbitals. Pi bonds happen when two atomic orbitals are in contact through two areas of overlap. Pi-bonds are more spread out bonds than the sigma bonds. Electrons in pi bonds are sometimes called pi electrons. Molecular fragments joined by a pi bond cannot rotate about that bond without breaking the pi bond. The rotation destroys the parallel paths of the two p orbitals. Atoms that are joined by a double bond have one sigma bond and one pi bond. If they are joined by a triple bond they have one sigma bond and two pi bonds. Pi bonds do not necessarily join a pair of atoms that are also sigma-bonded. In certain metal complexes, pi interactions between a metal atom and alkyne and alkene pi antibonding orbitals form pi-bonds. In some cases of multiple bonds between two atoms, there is no sigma bond at all, only pi bonds. Examples include diiron hexacarbonyl (Fe2(CO)6), dicarbon (C2) and the borane B2H2. In these compounds the central bond has only pi bonding. In order to get the most orbital overlap the bond distances are much shorter than expected. This page was last changed on 21 March 2018, at 05:00.